Apartments — not hotel rooms, hostel bunks, soft earth, or other people’s couches — is the new word in finding accommodation when traveling with my family. We will now travel the world in quick sprints, and then stay in hubs for one to three months at a time before making another quick sprint to another hub. The temporary stay apartment will be the cheapest and best modus operandi for taking accommodation while in these travel hubs. To these ends we rode a 160 peso ($4.50) bus up to the beach town of Sosua from Santiago. The trip took about two hours. 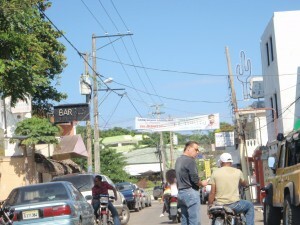 Sosua, a beach town in the north of the Dominican Republic would be our next hub. Upon stepping off the bus, a grim fact met us face on: a “cheap” room in Sosua would cost 25 USD per night. This is a lot of money. My family is on the usual $10 per person, per day scheme. There are three of us, which means that we cannot average over 30 USD a day — and we wish to actually live well under this mark. We can not drop this on lodging alone each and every day. We needed an apartment, and we needed one fast. There would be no time to poke around — if we shopped for the cheapest apartment for three days we would be out $75, and the benefit of finding this cheap apartment would be negated by the cost of the hotel room we would need to have used as a base of operations until we found it. We needed an apartment immediately. We needed to find an apartment on day 1 in Sosua. We walked through the streets searching. My friend Andy the Hobotraveler.com is in Sosua now. He picked up an apartment for 300 USD a month. The amount that he was paying was the benchmark we were shooting for. Chaya, my wife, Petra, my baby, and I walked through the sunny streets of Sosua. Our feet led us to the beach. Hotel runners, touts, and an assortment of street sharks descended upon us, their prey — we were. Walking through a town with your pack on your back is a clear indication that you are looking for a place to stay. No idiot is going to tramp around for fun with a full backpack on their back and another on their front. Everybody knows this. We rounded a corner that lead to a beach and found ourselves in the midst of a mild feeding frenzy. A few dubious looking sharks would run up to us calling out, “Hey man, you need a place to stay? Good place, cheap price just for you?” I could not lie. Lying is a stupid thing to do to a street shark — these people sit in the streets sniffing the seas for people like me for a living, they know what is going on, they know what I want. If I lie — if I say, No, I am not looking for a room, I am just going for a walk with all of this luggage strapped all over me,” then I just shed a little blood in the water for the sharks to frenzy over. So I don’t lie. Rather, I look them square in the face, say “I don’t want your help. Thank you anyway,” and walk on. The lock in prop is to get me to stop walking, to be corralled into a conversation, to make me feel like some sort of special friend who is different than the other tourists, to somehow box me into feeling that doing what they want me to do is the easy way out. Nobody can make me stop walking. Nobody can lock me in unless I choose to let them. I know this. This is a matter of inertia: if I stop my forward progress I know that it will be more difficult to start again. An object in motion tends to stay in motion, an object at rest tends to stay at rest. It is all about inertia, the less you hesitate, the quicker and smoother you let a runner know that you are not interested and walk through the barricade, the better chance you have of breaking free. So I don’t shake their hands — a sure fire lock in prop — rather I pat them on the outside of the arm and, effectively, clear a path. I don’t reply to their small talk with small talk — “Hello, where you from, man?” — rather I turn down their service outright — “I am not interested, no thank you.” I laugh a little at their props — “You don’t want to be my friend, you want to sell me something” and move on. I did this a few times while walking through Sosua, obviously looking for a place to stay. We were not given any difficulties, no barnacles attached themselves to us, the touts just offered their services and did not give chase. They seemed to have too much self respect for that. We continued looking through the streets for a room, an apartment, any PLACE to take refuge in. It had been a long couple of days for Petra, we found ourselves on the tail end of a two hour car ride across Maine, two flights, a five hour wait at the Santiago airport, a taxi ride, and a two hour bus ride. The tropic sun was also shinning bright on the pale skin of my little daughter from Maine — a land cloaked under an umbrella of clouds and cold and gray. She ruffled in her Ergo carrier, she let out a little yelp — she wanted to go home. We just needed a place. An apartment, a hotel, any place. We peaked inside of a couple hotels, $35 or more per night. We continued walking. Motorcycle taxis kept pulling up to the sidewalk and calling out to us. We shook our heads and kept walking. They offered to show us a hotel. We shook our heads at this, too. We were tired, the sun was hot, perhaps we could have used a Tenzig Norgay, a way in to this place, a way to find a cheap place to stay. Another motorcycle taxi pulled up. Sometimes, in otherwise bleak circumstances — like when every hotel you find is akin to a luxury resort — these guys can help you out of a rut. I stopped walking, I looked at the guy. He was plump and had on a light facial expression. I had an ok feeling. I told him I wanted a cheap hotel. He said he knew of one for $25. This was as low as I knew we could probably get. He hopped off of his motorcycle and lead the way. We followed. My wife looked at me like I was deranged. I had just shooed away a dozen of these guys, why was I now following this one? 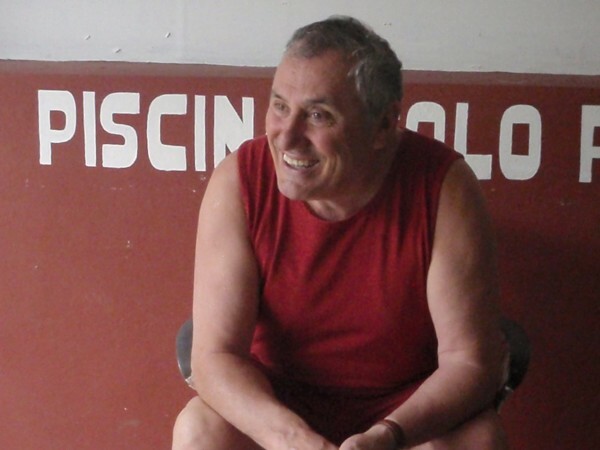 “I have a feeling about this guy,” I spoke, “what are our other options?” My wife shrugged. My wife knows well that, in travel, your intuition is a far better guide than your head. I had a feeling. We were going to follow it. We could always just walk away if we don’t like the place he would show us. The motorcycle taxi driver’s name was Louis, and he told us the name of the hotel he was taking us to outright: the Hotel Romanoff. He gave us his bargaining chips up front. We could have walked the other way and found the hotel on our own later if we wanted to, without having this guy show it to us. But we didn’t. We went to the hotel with a touch of skepticism, true, but we still went. We arrived. 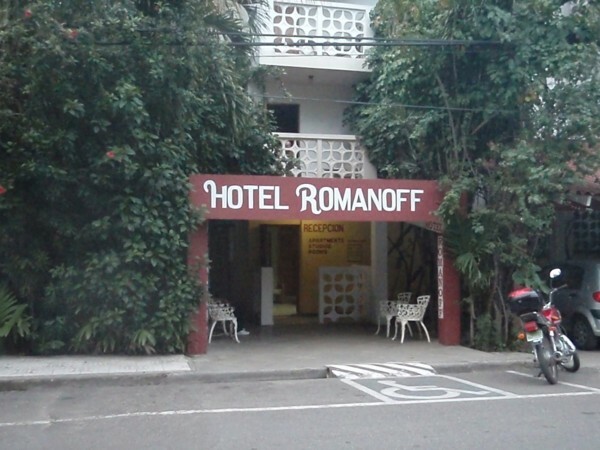 In front of the Hotel Romanoff was a collection of older expats from a collection of far off white people lands. They welcomed us to their home. 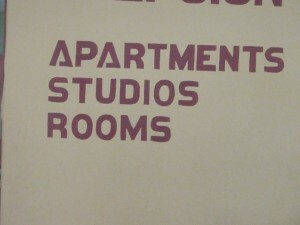 On the front wall of the hotel was the word “Apartments” painted in large letters. We decided to walk in. Louis followed to claim his chit. The lady who owned the place said $30 was the going rate for a room. I told her that Louis said $25. The lady looked at Louis. He split out the door. “It was $25 four years ago, but now it is 30,” the lady spoke in worn out USA English. She was a white lady from California. She was around 60, a little sinewy, moved swiftly, spoke bold words, and dealt her cards in a straight forward way. I wondered how she ended up here. I asked about the apartments. 400 USD a month, there would be no negotiating this price. I asked to see one. It was good. It came with a kitchen, a bathroom, hot water, WIFI, screens on the windows, and a refrigerator was promised to us if we moved in. There was also pool in the hotel complex that we could use, as well as little paths that wove their way in between large, shady palm trees and other tropical plants. The place was lush with vegetation and shade. All over the place older expats from Germany and Canada lounged around, just enjoying the place, the sun, seemingly pleased with themselves that they are sitting around bare bellied and speedoed when their brethren are home shivering under coats and parkas in their northern homeland. I was pleased with myself for being here, too. I had escaped from Maine. Any place with sun and warmth seemed good to me. 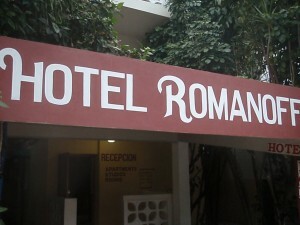 The Hotel Romanoff seemed comfortable enough. I walked out to the swimming pool to determine the hotel’s maintenance quality. It takes effort to keep an outdoor pool clean — especially one that has trees all around it. If this pool was clean then it would be an indication that the hotel keep itself working well. The pool was sparkling and clear. We told the owner we would look around. In travel, you can’t take the first place you come upon. It is a rule. I think it may even be written somewhere. We walked around for an hour, found my friend Andy, and then returned. The place was ours. The previously promised refrigerator was already in place. We found a home, a hub, a transitioning point between coming and going. A base of operations for our travels around the Dominican Republic. Surprised you didn’t just head to Andy’s place, dump your kit, leave the girls for a moment while Andy and you ran around — perhaps to some places that Andy had already evaluated. I would’ve probably found a room for you somewhere once you’d bought your ticket so you didn’t have to hunt. We did do something similar after finding the apartment. We walked around for a little while all together. Did not come up with much though. The room we got is pretty good. A little pricey, but comfort figures into logic value a little more right now. After we get going with the baby I think there should be a little more lee way for pushing it a little more. Maybe you could find us a room in Peru haha. Wade, how you can go through all that and find time to write an excellent post….Way to go. Looks like you’ll get to enjoy the warm weather, pool and the people now that you have a home base. I learned a lot from your post, especially about people who want to stop you, shake your hand, etc. Keep on moving. Even though you let someone lead you to the hotel, you followed your gut. And your instinct was right. Now I’m curious about the lady from CA. I wonder what her story is. If she’s missing her 2 front teeth, be careful. She gives great head, but she’s dangerous. You sound like you speak from experience in regards to those dangerous women haha. I am sure she has an interesting story. Will try to find out what it is. Very good post. I would be interested if, over time, you find hte Sharks treat you differently as a family than they did when it was just the two of you, or just you. Also, Chaya’s impressions as to how she is treated differently as a woman travelling with a family, rather than a single or accompanied woman. It is my impression that they think they can get more money out of me now that we have a child. I suppose having a kid is another sign of some monetary status. But I don’t think we have yet paid more for anything because of it. It will be interesting. Trust me, you don’t want to live in Lima for a month if you don’t have to. Haha, yes, I suppose you are right. I really like the Cerro de Pasco region, maybe we will stay there.